Photograph 1 - At Mount Moriah Cemetery, Deadwood, South Dakota. 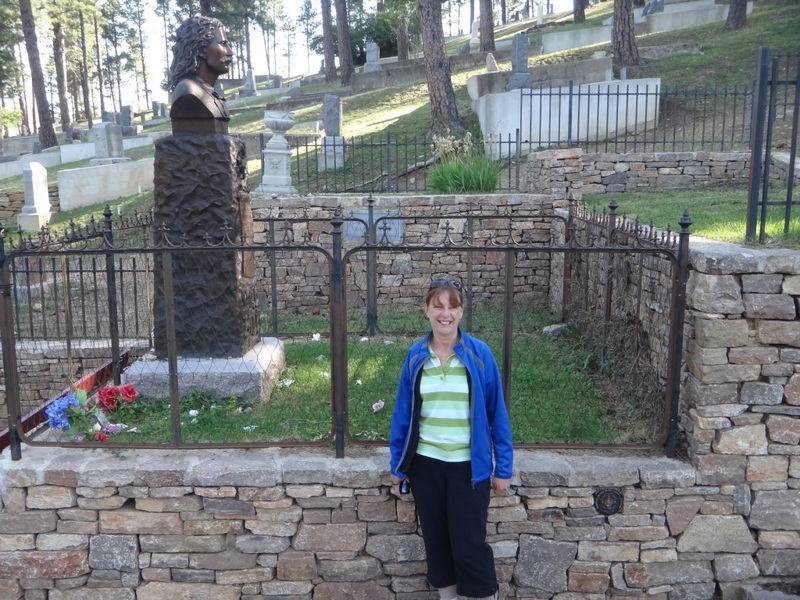 Anne is standing in front of James Butler Hickok and Martha Jane Canary (Burke) graves. Aka, Wild Bill Hickok and Calamity Jane. 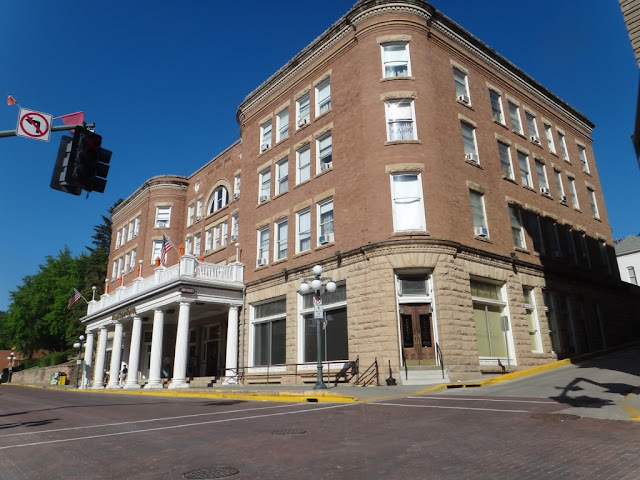 Photograph 2 - The Franklin Hotel in Deadwood, South Dakota is reasonably new. But the site was the Number Ten Hotel where Wild Bill Hickok was shot in the back of the head whilst holding 3 aces and two eights (the deadman's hand) back in 1876. 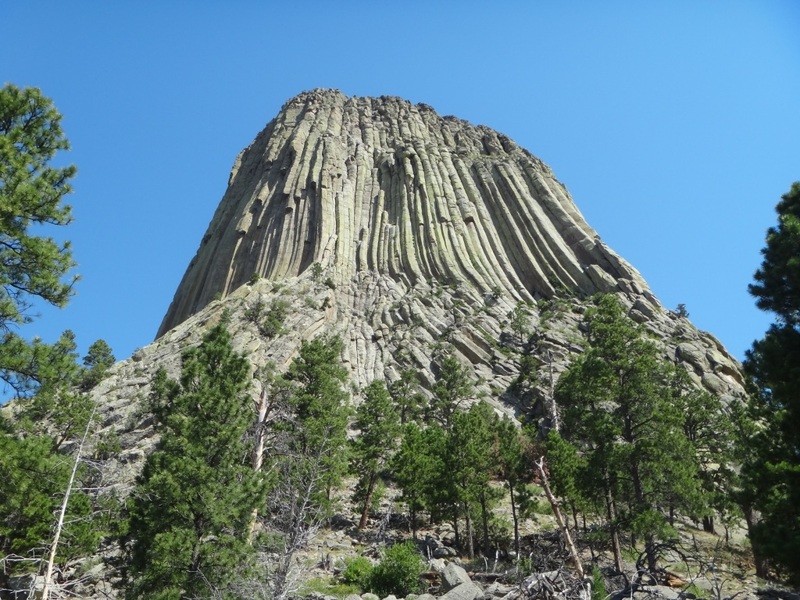 Photograph 3 - The Devil's Tower in Wyoming. We walked the 2 klm plus around the base of this feature. We don't know how Richard Dreyfus ever climbed this monstrosity in Close Encounter of a Third Kind! Photograph 4 - The Devil's Tower Wyoming from a distance. We didn't see any alien spaceships on this rock. 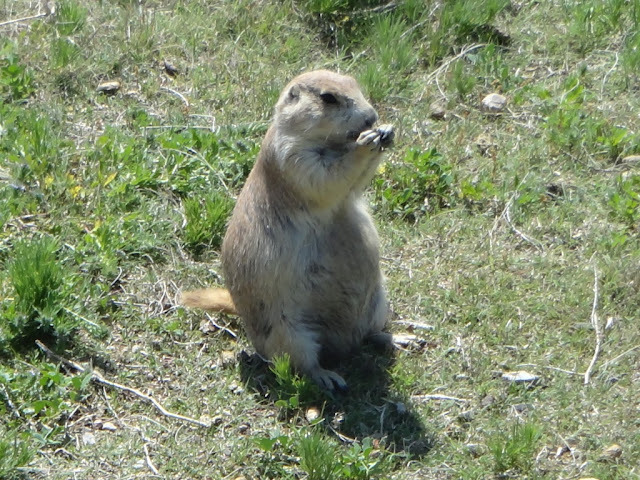 Photograph 5 - There were many prairie dogs at the base of Devil's Tower. They love to pose for tourists. Photograph 6 - Lt Col George's Custer younger brother also died at the Little Bighorn battle. Almost next to each other. Little Bighorn Memorial site, Montana. Photograph 7 - The site where Custer fell during the Little Bighorn battle. His remains (after the Indians had performed their brutal "spirit releasing" processes on him) were removed to West Point in the eastern states two years later. 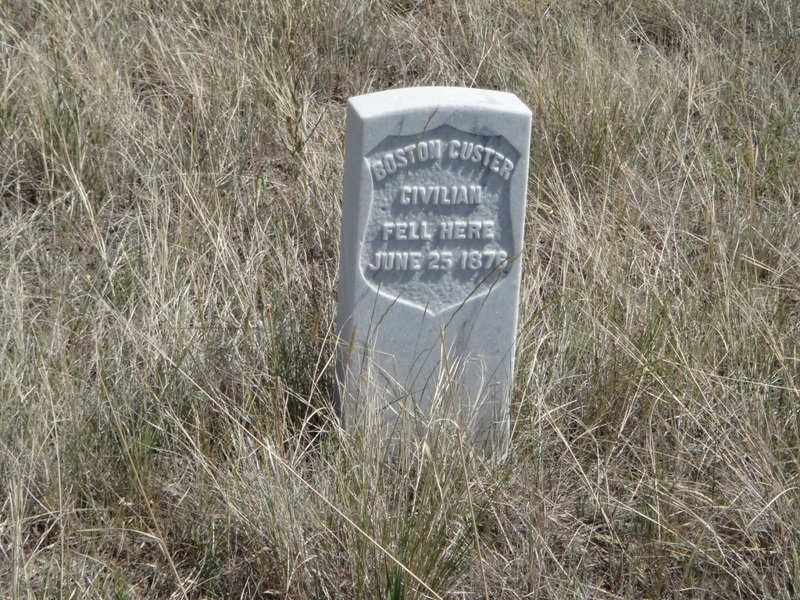 Photograph 7 - There were a total of 220 soldiers who were massacred with Custer at the Little Bighorn, most of them were scattered over a two mile ridge. 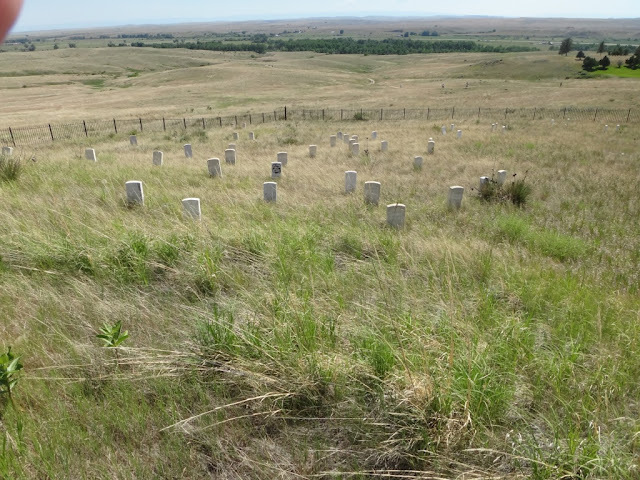 This site is where Custer himself and about forty others fell. The green area in the background is the Little Bighorn River, the site where over 6,000 Indians had their teepees and came up the ridge to slaughtered their enemy. 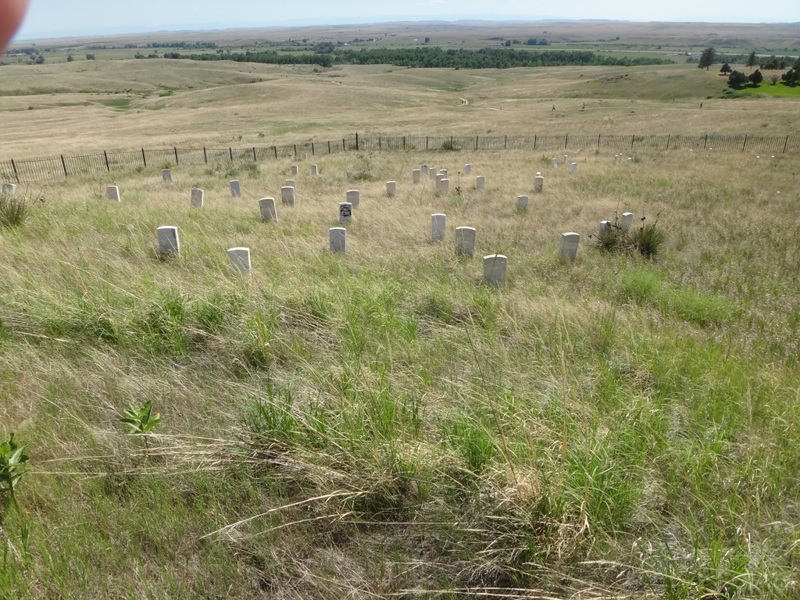 Photograph 8 - The site of the main battle between Custer and the Indian tribes at Little Bighorn, Montana. They say only 60-100 Indians died during this battle. Of interest there were plenty of rattlesnakes living in the tall grass around this memorial. We had a really interesting day. It was a long drive between Hill City, South Dakota to Bilings in Montana. We left Hill City at 7am and arrived at Bilings about 5:15pm. However, we diverted from the main highway to visit another "rock". 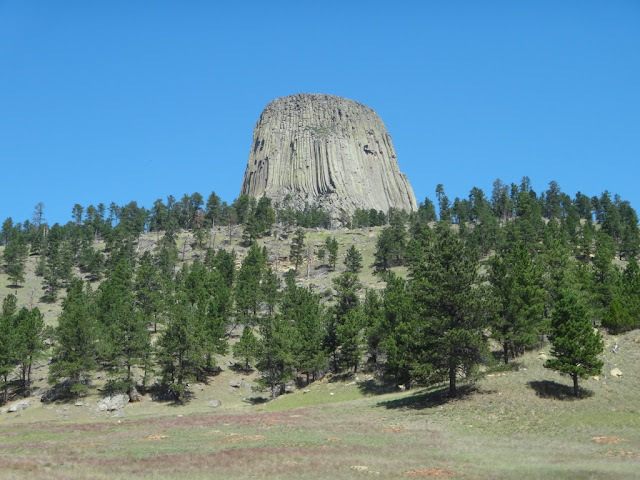 Our journey was organised to stop at three sites: Deadwood City in South Dakota, Devil's Tower in Wyoming and the Little Bighorn in Montana. First about Deadwood - we arrived rather early and went to Mount Moriah Cemetery and paid our respects to Will Bill Hickok and Calamity Jane. We had to pay $1USD each to enter the cemetery - even in cemeteries there is an admission fee! As the above photo states Wild Bill was murdered in the Number Ten Hotel whilst gambling. However, Calamity wanted to be buried next to him on her death - because of her association with Bill (some say they were married) and her death wish the legends and stories became twisted over the years. Fascinating about Calamity's real name - was it Martha Jane Canary or Martha Jane Burke? - nobody can answer that for us. Neil did buy some interesting reading about her life perhaps the answer is written in these publications. 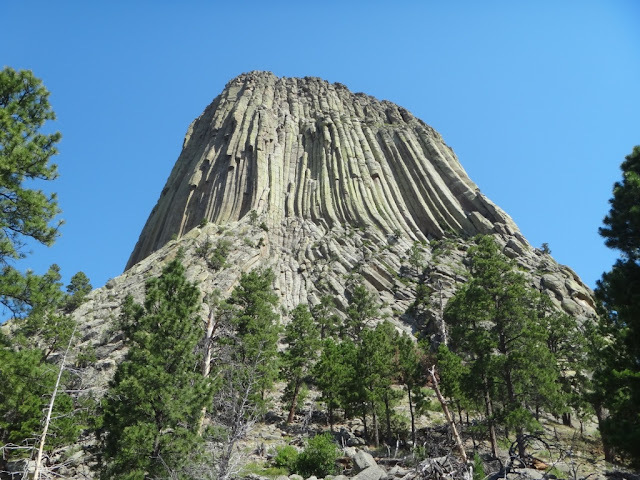 Our next stop was Devil's Tower. Off the beaten track a bit but well worth it. We unintentionally walked the 2.1 kilometres pathway around its base. It was an easy walk and rather pleasing to gather nature's surroundings. We didn't see any alien markings or Close Encounters of a Third Kind stuff and cannot believe how anybody can climb the precipitous walls - but there are climbers who actually use ropes and ladders - insane people! At the base of the tower were many (hundreds) of prairie dogs. Funny creatures to watch. They act like meercats watching around for predators. They were oblivious to humans however. 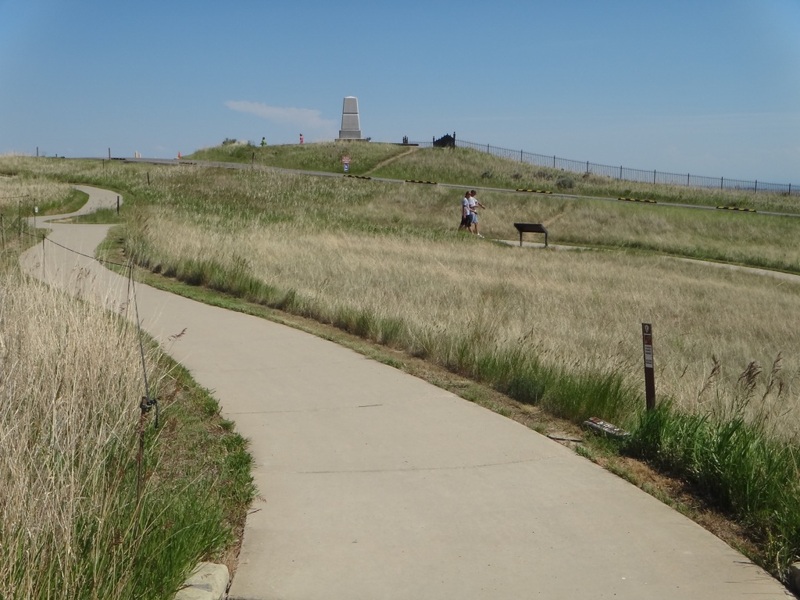 From Devil's Tower and after crossing into Montana we visited the Little Bighorn Battle site. It's almost the day 136 years ago since the battle occurred. There was a reenactment going on but not at the actual battle site. We made it just in time to listen to a ranger (and an Little Bighorn author) who gave us a complete story what occurred. He was great and explained all facets about the battle - completely unbiased and in fact completely accurate as much as he had researched. 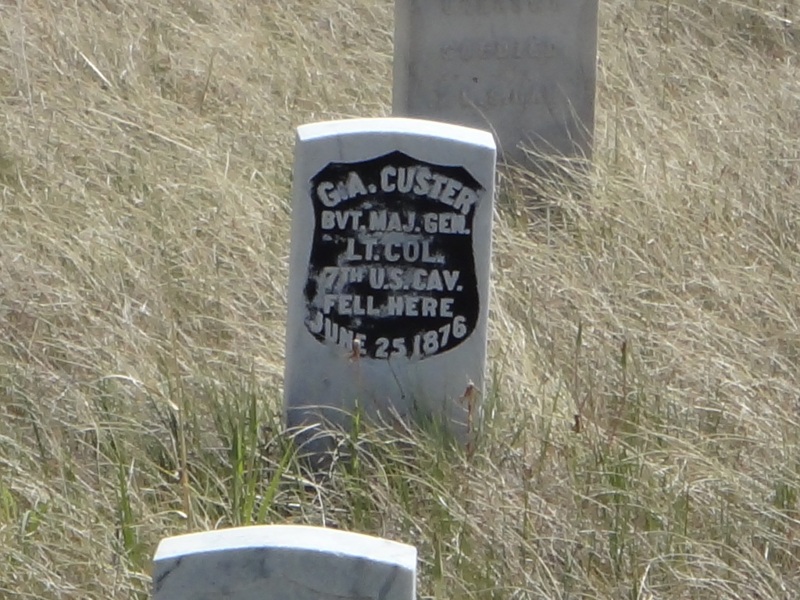 It is amazing how Lt Col Custer found himself in this precarious position and made many blunders. In the end the Indians won the battle but they lost the war - sad. Tomorrow we are on the road again and headed north-west to the Glacier National Park in Montana and near the Canadian border. We will be spending three nights there and resting. Until then - cheers.